The D-Type sports car. Just like its predecessor the C-Type, the D-Type Jaguar was built with the sole purpose of winning at Le Mans. This it did in style, winning the 1955, 1956, and 1957 races. In fact, in 1957, the D-Type took the first four and sixth place, and completely routed the opposition. 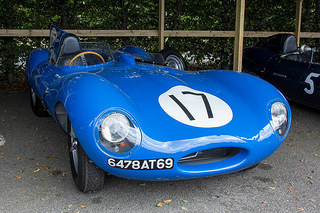 It was Jaguar's most successful race car. Long before the 1953 victory at Le Mans by the C-Type, Jaguar cars had decided to develop its replacement that would keep the company ahead of the competition, which was primarily, Ferrari, Alfa Romeo, Aston Martin, and Maserati. In 1953, the first D-Type prototype, with chassis XKC401, was put through its paces in Belgium, where it reached a top speed of 178.3 mph, which was around 30 mph faster than its predecessor. By May 1954, six-D-Types had been built, and were regarded as the most advanced cars at that time. There was an entry of four D-Types in the 1954 Le Mans race, but they were no match for the powerful Ferraris. However, in 1955, following modifications to the car, it duly notched up Jaguar Cars' third Le Mans victory. 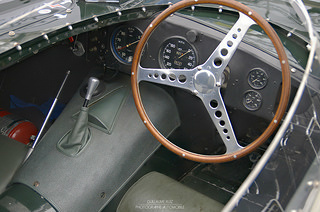 Most of the D-Types were single seaters, and built specifically for the race track. Not only was there a 10% reduction in the overall weight of the car, but also the surface area of the front section was reduced, so improving air flow over the body. As a result of wind tunnel testing, the D-Type produced 28% less drag than the C-Type, whilst the long nosed D-Types of 1955 were 20% more efficient. The D-Type was at the forefront of sports car development with its use of a stressed skin monocoque central section. This was constructed from sheets of aluminium alloy incorporating riveted fasteners, which were then welded to front and rear tubular sub-frame sections to reduce weight. The C-Type provided the rear suspension which consisted of torsion bar springing. Later versions of the car used bolts, rather than welding, to allow for easy removal for repairs. The early cars used a magnesium alloy body, frame, and suspension but, by 1955, the expensive alloy was replaced by aluminium and steel equivalents. The D-Type Jaguar sports car was powered by a competition 3.4 litre XK engine, and linked to a four speed gearbox. With a compression ratio of 9.0:1, a revised block, larger valves, and three twin choke Weber 45 DC03 carburettors, it developed 250 bhp at 6500 rpm, and 242 ft/lbs of torque. This produced a top speed of 160 mph, and a 0-60 mph time of 5.7 secs. In the late 1950's, the original 3.4 litre engine was increased to 3.8 litres which now developed 265 bhp, a top speed of 179 mph, and a 0-60 mph time of 4.7 secs. It was equipped with disc brakes all round, independent suspension at the front and a solid axle at the rear, and dry sump lubrication that reduced the height of the engine. Since the surface area of the front section had been reduced, the engine was tilted slightly so that it would fit into the engine bay. The result of this was the appearance of a bulge in the bonnet. 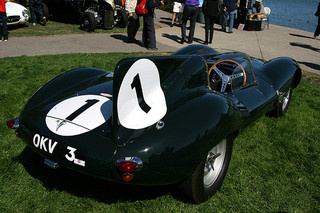 The 1955 D-Type sports car used larger inlet and exhaust valves together with an asymmetrical cylinder head. A large fin was positioned behind the driver's seat in order to create aerodynamic stability from cross winds when travelling at more than 150 mph. The fin was the most recognisable feature of the car. In 1955, the length of the works cars was increased by 7.5 inches by the addition of a longer nose which helped to increase top speed. Also, the fin and driver's headrest were later redesigned to produce a single unit to improve aerodynamics and reduce weight. Produced between 1954 and 1957, most of its mechanical components were sourced from the C-Type. 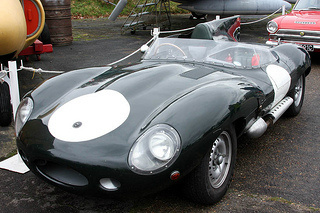 Jaguar cars was keen to provide factory support to private D-Type owners. Originally, there were to be 100 production D-Types, but this was subsequently reduced to 87 in August 1955. Although a number had been sold, by early 1957 when production would soon end, some of those remaining were converted into XKSS Jaguar sports cars, a road going version of the race car. Later in 1957, 87 D-Types had been built, consisting of 18 works cars, 53 private customer units, and 16 XKSS variants. Of these, only ten D-Types ever secured a place at Le Mans. Towards the end of 1957, Jaguar cars decided to produce a D-Type body made from fibreglass that would replace the existing aluminium alloy structure. Following rigorous testing, it was found that the construction, fibreglass materials and resins were not sufficiently strong to withstand the car's power, and so the idea was dropped. In February 1957, there was a severe fire at the Coventry factory which destroyed five D-Types, together with essential jigs and tools, plus damage to the production line. As a result, this marked the end of production of the D-Type sports car. On the second hand market for Jaguar cars, an original 1955 D-Type in superb condition was sold at auction in the US for $5 million in 2014. This represented the highest price ever paid for a D-Type. The D-Type is unquestionably a true classic sports car. 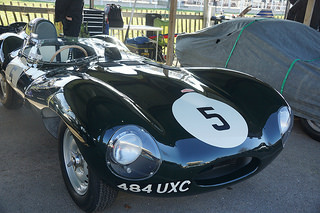 A 1954-57 replica Jaguar D-Type in excellent condition would fetch in the region of £55,000/$90,000.